Castiglione trained in his native city under minor animal and landscape painters in the 1620s. There he probably also knew oil sketches by Van Dyck and Rubens as well as Venetian paintings by the Bassano family. Castiglione's numerous independent drawings, done in brush and oil pigments, reflect these formative influences. During most of the 1630s the artist was in Rome, where he acquired a taste for classical subject matter, antiquities, and knew the works of Poussin. In the 1640s Castiglione returned to Genoa, where he executed a number of important commissions for church altar-pieces, and pagan and pastoral subjects for private collectors. 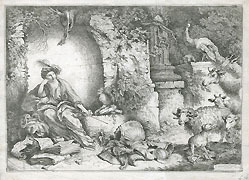 Around 1645 he created several etchings and repeated some of these compositions in monotypes, a technique he seems to have been responsible for inventing. On his return to Rome in 1647, Castiglione brought along his etched plates; beginning in 1640s, he had them published by Giovanni Giacomo de' Rossi. In the prints he made in Rome in about 1650, Castiglione showed careful attention to Rembrandt's etchings of the 1630s, adopting from them the Dutchman's dense, scribbly fines to produce rich textures and a range of dark tonalities. Also in about 1650, Castiglione's work took on aspects of the dramatic and emotional Baroque styles of Pietro da Cortona and Gianlorenzo Bernini, then at the height of their careers. His contacts with Pietro Testa and Salvator Rosa date from this time. After 1651 Castiglione moved to Mantua, where he remained in the employ of die ducal court, making occasional visits to Venice and Genoa until his death. Castiglione's some sixty etchings were popular and influential. His most immediate followers were his brother Salvatore, his son Francesco, and the Genoese painter Bartolomeo Biscaino. 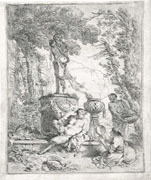 In the eighteenth century Castiglione was copied and imitated, and his mysterious, magical elements - turbaned orientals, enchantresses, owls, and monkeys - reappeared in the imaginative works of Giovanni Battista Tiepolo.